Since the beginning of the 21st century, a fashion accessory has taken on increasing importance for men who go all out for style when it comes to fashion. 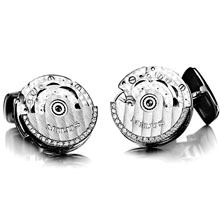 Cufflinks are again adorning elegant shirts at galas or everyday’s activities. Milus has underlined and encouraged this clearly flourishing tendency by enriching this category of men's accessories with a marvellously extravagant creation. It goes without saying that the exclusive Swiss watch company would create something exceptional – and once again express the idea of movement and playfulness that is so important for Milus: this time with cufflinks in the form of a mechanical watch movement showing attention to detail with the moving rotor as a special eye-catcher. Classical, stylish, elegant. To sum up: the unique Milus cufflink 'Joaillerie' collection, newly launched this year, is consummate in form and urbane in character. This small, almost playful object and its direct connection with the overall personality of the company make it clear that Milus is not merely working the market but living by its philosophy – doing business and bringing new creations into being according to that philosophy. 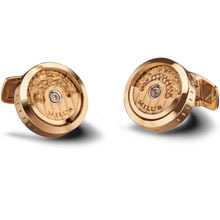 The familial connection between the famous Milus timepieces and these extravagant cufflinks is absolutely unmistakable. 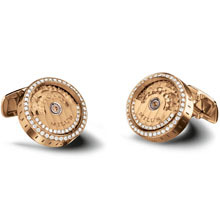 The Milus cufflinks 'Joaillerie' are available in white gold and pink gold versions, with and without diamonds. According to preferences in fashion and taste these pieces of jewellery in 18-carat gold can be combined with any outfit and shirt. Milus uses casting – probably the oldest of shaping processes – to give this accessory a form based on that of a watch movement. The stainless steel and brass rhodium-plated or plated 3N cufflinks in the form of a real mechanical watch movement complete the collection in 18-carat pink gold and white gold. Little fashion details like fine cufflinks are a sure sign of real style. Milus purposefully created an exceptional form of cufflinks with charismatic style that goes far beyond mere functionality. An accessory to be passionate about – and commitment to a theme: the Milus timepiece. The watch collector can now amusingly wear the heart of his watch – the movement – on his sleeves, giving this pulse beat a new setting. 'Milus' on representation of rotor engraved with ‘Côtes de Genève’ pattern. Milus logo engraved on the stud. Available with 38 white diamonds inlaid (Top Wesselton, IF-VVS). Recommended retail price: CHF 4’700.00 – without diamonds. Recommended retail price: CHF 5’700.00 – with diamonds. Recommended retail price: CHF 5’200.00 – without diamonds. Recommended retail price: CHF 6’200.00 – with diamonds.